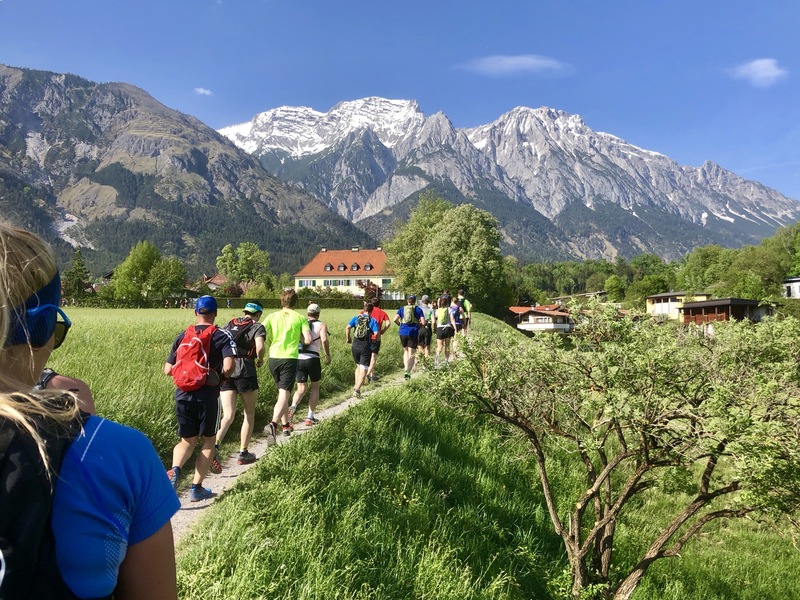 The Innsbruck Alpine Trailrun Festival is a fixed date in our schedule since 2016: The first year we ran the K25 trail halfmarathon from Innsbruck to Natterer See, the second year we tackled the K42 trailmarathon from Natterer See to Innsbruck – and in 2018 we decided to run the shortest distance, the K15 Rookie Trailrun! Another perfect trailrunning season opener @ Innsbruck Alpine Trailrun Festival 2018! The IATF 2018 is always scheduled on the last weekend in April and this year it already started with the 1. Innsbruck Nighttrail (INT18) on Thursday, a 7k Warm-Up over the roofs and lights of Innsbruck, the heart of the Alps. Unfortunately we had to work and weren’t able to attend, but it’s definitely on the list for next year. When we arrive in Innsbruck, the weather is as perfect as the last years: Sunny, warm and welcoming. Even though we are late, we still manage to pick up our bib numbers at Landestheatervorplatz Innsbruck, where the trailrun city is located and all the actions take place. We enjoy some potatoe dumplings for carbloading and as the Rookie Trail only starts at 4:30PM the next day, we also still enjoy the city a little by night. The next day starts early for most of the runners. At 4AM the K85 runners are on their way, followed by K25 & K65 at 8AM. On all these distances (including the K42) it is possible to collect UTMB-points, ATRA-points are given for K65 & K85, so there are quite a few determined runners at the starting lines! Third year, same spot, same great day! At around noon, the first runners of K85 and afterwards K65 arrive and the Landestheatervorplatz starts to fill up. Our shuttle to Hall leaves at 2:30PM and when we arrive in Hall it’s a big party: Runners from all longer distances passing through the historic town center of this little village, music and a great atmosphere make a perfect Warm-Up for us. 🙂 We also meet many well-known and also some not-so-well-known faces, before we leave for Innsbruck at 4:30PM sharp. The Rookie Trail is 15 kilometers and 400 altitude meters in total and takes us through the ancient town center of Hall first, slightly ascending as we run leave the city. The sun is bright and the first uphill hot, but the great views of Nordkette and the surrounding mountains make up for all the effort. The K15 are also the last 15k of the longer 85, 65 and 42k distances, so runners quickly start to mix up. We manage to overtake some “long-distance-hikers”, but also get caught up by the ones still good on foot. After the first 150hm, we follow a wide path and later on a flowing trail towards the first aid station in Thaur on 804m. The views above Hall and Innsbruck are great and the shadow of the alpine forests very well appreciated. Now rolling hills and some houses are interchanging, leading us more and more towards Innsbruck. Approximately always on a height of 750 to 950m, we pass some ancient ruins and many water ressources which we almost all use to cool our necks and heads – it’s boiling hot! It’s the same route as in 2017, but with some slight changes and a new great trail, the Minzentalweg, in the end and we’re already excited for the new parts. After passing through Reschenhof, the second aid and water station, the road goes slightly up again, and some more great views are coming up. The last and most exciting part is the downhill via Minzentalweg: In many serpentines the trail leads down towards Innbsbruck, passing by the famous Hungerburg and dropping out right at Innsbruck Alpenzoo, we quickly loose on height and approach the finish line in the heart of the city centre in Innsbruck. We made it: 15k Rookie Trailrun @ IATF18! It wasn’t as long as the years before, but it wasn’t less exciting or fun – and we’re also proud to be able to cover this distance not even four months after the accident! Thanks so much at Laufwerkstatt for another great event with top organization, top food and great people. 2018 is for the books, 2019 is coming for sure – hope to see you again! Crossing the finishline is always a great feeling! In friendly cooperation with Innsbruck Alpine Trailrun Festival. More information: www.innsbruck-alpine.at – thank you!